I had already discussed on this topic in my previous article where I had shared 5 benefits of using hashtags. I highly recommend you to read that post first. Now you know all their benefits but did you know the correct way to use them? Most probably, your answer will be no. But don't worry. After reading this tutorial, you'll get to know about the correct way to use them in your social media posts. So let's start from basics. 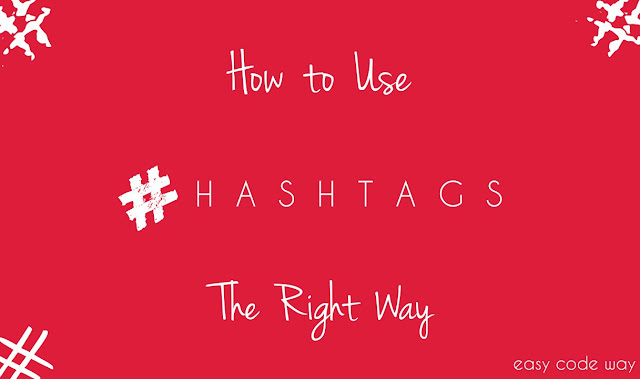 What are Hashtags and Keywords? Before moving to the main part, let me ask you one simple question. What do you think about hashtags? In shorts, hashtag is a word or a phrase preceded by a hash sign (#) which is used in social media sites to highlight the topic. They will add a link to your post which will help users to find more stories related to that topic. On the other side, we have keywords. Keywords are the word (or again small phrase) which tells about the topic. For example, If I am sharing a post on how to install Android apps then Android, install and app are the three keywords which are describing the topic here. All other words are just normal. Now if you want to use hashtags in this title then "Android", "Install" and "Apps" are the best keywords you can target. So basically, you should use hashtags in important keywords only and in this way, both these things are interconnected to each other. Now the question may arise that how it will help you? To understand this deeply, let's have a look at below case. Whenever you'll post anything, user will look for most interesting keywords only. In above title, Android is the most important keyword but instead of it, if I'll add hashtag in other useless words like "How", "to", "in" etc., then it will be of no use. On the other hand, one reason why hashtags are important is that they helps users to find more posts related to that particular topic. If it would be of no value then it will reflect negative impact on users. Again a big no from my side so you should avoid this thing. What I want to say here is that, use relevant hashtags only which can be useful for users. Now lets see how to use them correctly. Below are few tips which you should consider while using them in your social media posts. If you're writing a post and combined more than two keywords in a single hashtag than it may drop your potential reach. For example, if you'll use "#InstallAndroidApp" then very few people will find your post as no other people have used this hashtags. So its better to use one or two keywords only. Single keywords may be hard for you to rank high in result pages, so its better to target two keywords which have comparatively low competition and high-ranking. For example, you can use "#AndroidApp" instead of "#Android" only. This is because, "Android" keyword may be hard to target as many verified users may be using it which will be ranked high to your posts but chances are "AndroidApp" has less competition. Apart from this, if you'll use three or more keywords then again its ranking will reduce. In this way, you've to choose correct keywords and hashtags. Special characters including symbols (like $ & %) and punctuation are not accepted or in other words, they have nothing to do with hashtags. However, you can use any number. But in my advice, avoid them to use in your posts. They will do nothing for you but definitely, drop your potential reach. One more important thing which I want to clear is that, don't use "_" (underscore symbol) to separate two keywords. I have seen many people using these kind of hashtags. But in correct way, you should join all keywords one after another like this - "#WindowsTricks" not "#Windows_Tricks". Always keep it short, simply and accurate. Facebook, Twitter, Instagram, Google+ and all other social sites gives first priority to official users only. Even in case of hashtags, verified accounts are displayed first in result pages. But unfortunately, many of us or I should say, all of us don't have verified accounts so it become hard to rank high in those high competition keywords including trending hashtags. So what to do then? There is simply trick to troubleshoot this problem. As already mentioned, you can use low competition keywords which are easy to rank high. For this task, you can also join two keywords which will lower down the competition. Pro Tip: To be on safe side, use both low and high competition keywords. This is the most important thing which you should keep in mind before posting anything. Obviously, it will look awkward when you'll hashtag each single word of your post. Ultimately, this will reduce the readability of your article and user will be confused between your links, normal words and targeted keywords. I have seen tons of people doing this mistake but at least you should avoid this. Normally, I use only two to three hashtags per 10-15 words. Try to maintain this same ratio so as to balance user experience. If you own a private company or online blog/website then hashtags can do wonder for your business. They can help you to build better brand base on social media sites. The only thing you need to do is to create your company name hashtag and share it everywhere. Also encourage your fans or other people to share your hashtag. For this task, you can conduct small competitions and offers. This all will help people to find more about your business. They can see what other people are talking about you. Moreover, this will also make it easy to find every content related to your business under a single roof. If you're a public figures or any other official person, then you can also use your real name. Many celebrities are doing this and it's a very good practice. 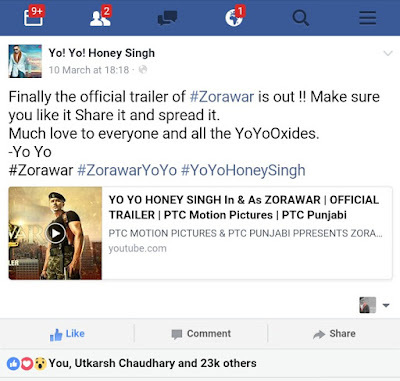 Below is the screenshot of Yo Yo Honey Singh's post where he is using his own name hashtag. You should also use them at the end of each post. Wrapping up all above points, lets recall all do's and don'ts which you should keep in mind. Below is the complete list. Make sure to target low competition keywords. Use your company or business name hashtag. Keep it short, simply and accurate. Don't join more than 2-3 keywords. Don't hashtags every single word. Don't use special characters (like % & $) and punctuation. Don't use numbers unless necessary. Now I just hope that you're ready to use hashtags in right way. So what are you waiting for? Go and do miracle in your social media posts. If you've any doubts, fell free to ask me in below comment box. Stay tuned for more interesting updates.